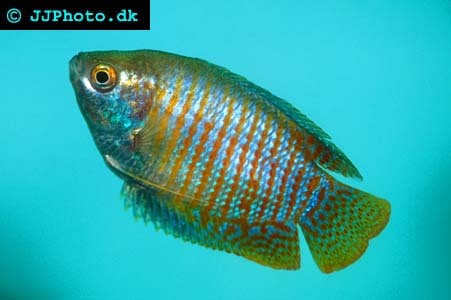 Company: Colisa lalia (Dwarf Gourami) is best kept with other small peaceful species. Aquarium setup: Colisa lalia (Dwarf Gourami) should be kept in an a densely planted aquarium tank. They should be provided with floating plants. Allow the the plants to dim the light in the aquarium. Colisa lalia (Dwarf Gourami) should not be kept in aquariums with to heavy circulation. Dwarf Gouramis can as the name suggest be kept in small aquariums. Colisa lalia (Dwarf Gourami) can be sensitive to nitrites. Feeding: Colisa lalia (Dwarf Gourami) accepts flake food. Breeding: Colisa lalia (Dwarf Gourami) are bubble nest builders that build there nest on the surface among dense vegetation. The male guards the nest and the eggs there in. The females do not take part in the breeding process once their eggs are laid and the males will chase them away. The male guards the fry until the fry become free swimming.